Yes it is a terrible problem all those smoking people in the streets and at terraces. They almost look like junks assembled in front of shops and public buildings. Better outside amongst traffic fumes than inside. Being a non-smoker myself, and having asthma, I do have a hard time with this. But hey, to each their own. I'm happy about the ban in buildings, but it's everyone's right to do as they please outside and in their own homes! That's quite a picture though. How often do they clean those up!? Yup, I know exactly how you feel. Just yesterday I was walking to a store and had to hold my breath to get past the covey of smokers outside the store. Yuck...in Montreal there are actually fewer and fewer people smoking since the same rules have been put in place. No smoking in public buildings or on any school grounds and smokers cannot smoke within 9 meters of the doors to any public building. It makes the streets so dirty and smelly :/ I hate smoking! 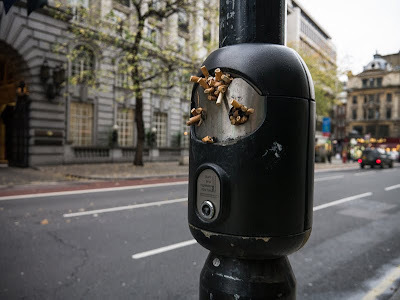 The people who seem intent on pushing me to physical violence are the drivers who constantly flick their ash out the window and then throw away their still smouldering butts. If you can afford to buy cigarettes, you can afford the £10/$15 for the optional ash tray in your car. Use it you filthy buggers! Gross! I haven't seen this kind of thing. But, I guess it is better than having them smoking inside, as they did in the old days. I wish I understood the appeal (and I have smokers in the family, sigh). NYC and DC also face the same problem - I think they banned indoor smoking around the same time as London. Now it's hazardous outside. Oh, yeuch! It's one of the things which makes me cross - that one can no longer enjoy eating outside at pubs and restaurants. I'm glad indoor workers are no longer required to spend their days in smoke but not that smokers are sent outside to mess up the fresh air. It also looks like a face, and someone wearing a helmet. On the other hand, fewer and fewer people are smoking. I am a former smoker. Today I hate everything about tobacco.